I have been asked by the present Editors to write an article to shew something of what our School was like fifty years ago, so I will do my best, but, in proper school-boy fashion, I must begin with a few excuses; thus, there do not exist, as far as I know, any pictures, or photographs, which show the whole Mint Yard as it used to be in my first school days, and so critical readers must not forget that there is only memory on which to depend – the memory of a youngster 14 years old – but then, I must add to that, with much gratitude, that my old friend, Dr. Mitchinson, my Head Master in those far-off days, has kindly looked over my rough plan, and has made some corrections and suggestions of which I have gladly made use. I have had no possible scale by which to draw my plan, so comparative dimensions may be more or less faulty – and, therefore, I can only give it to you, such as it is, from the impression of memory.Part of the Auditor’s garden. 1. The Auditor’s house is now occupied by the Seneschal. 2. The Auditor’s house, with entrance at (A), as now. 3.·The Cathedral Architect’s house, now the Grange, with entrance through wall and house (B). 4.·Part of the Architect’s garden, now mainly occupied by extra Grange buildings. 5. Houses, &c., towards Palace Street. 6. The Borough, leading to Northgate. 8. Old position of the Precinct Gates. 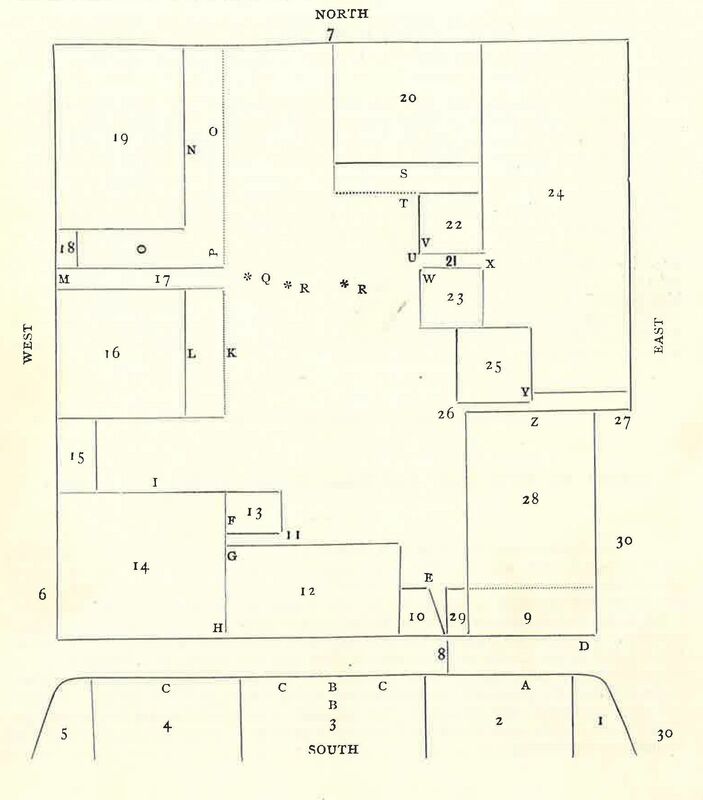 9.·Gate-keeper’s Rooms, with entrance marked (D), afterwards (1) a Class Room; (2) Carpenter’s Shop ; (3) Tuck Shop. The dotted line shews the width of this room below the School room. 10. A small house kept as a Tuck Shop by a Mrs. Norton, entrance at (E). 11. A wooden staircase to the Boarder’s Hall, &c.; (F) shews the staircase to the Dormitories above ; (G) the entrance to the Hall. 12. The Boarder’s Hall – (H) the doorway from the Hall to the Head Master’s House. 14. Head Master’s house with entrance at (I). 15. Small bit of garden belonging to the Head Master. 16. The Cathedral Organist’s house with entrance at (L), small garden and railings in front of it, with entrance gate at (K). 17. Passage way between walls to large wooden gates (M) which were always kept shut, now bricked up, but the position of them may still be seen from the arch in the street outside. 19. Second Master’s house with entrance at (N), with fenced-in garden (O), and entrance to it at (P), an old pump (Q), the two trees then as now (R). 20. Mathematical Master’s house, with entrance at (S), with small garden and railings in front of it, with entrance gate at (T). 21. Entrance hall with entrance at (U) with staircase leading to dormitories above, and with a locked door at (X) leading into the Head Master’s garden. 22. Class room with entrance at (V). 23. Class room with entrance at (W). 24. Head Master’s garden, with entrance doorway at (X). 25. Library, now called ‘old’ to distinguish it from the ‘Parry’, entrance at (Y). 28. The School room with entrance as now at (Z). 29. Now called the “rabbit-hutch”, was then the bedroom of the Gate-keeper, and was reached by a staircase from the lower rooms marked (9) in plan. 30. Part of Green Court – as now. And now we must try back – to make some special notes, and I think that it will be simpler and clearer to follow the numbers in order. To begin then with No. 2, the Auditor’s house, which is now known as the Seneschal’s house. To this belonged in those days our present Museum, as is shown by the entrance door on its south wall. This room was given over to the School about 20 years ago. Next we come to Nos. 3 and 4 – of which there is a good deal to be noted. The present Grange, as we call it now, was a private house occupied by Mr. Austen, the Cathedral Architect, but the house only then extended as far west as the end of the present scullery and the building which is now used as a Carpenter’s Shop; all west of this, including the stone passage and the turret staircase and dormitory, was added when the School obtained the place and it was turned into a boarding house for the Second Master, after whom it was then called “Pips”. The present Masters Common Room was Mr. Lipscombe’s dining room, and my old class room his drawing room, and these, with all the rooms above, Masters and Matron’s, formed his private house; the other class room was his boarders hall, and the present Grange Study was then also a study for his senior boys. Outside, during Mr. Austen’s occupation, the piece marked (4) in the plan, the present Masters garden, and the part now used for tennis, &c., all formed Mr. Austen’s private garden, which extended right up to the railings which now form the boundary of the Junior School, but in those days, in place of the railings, there was a wall which followed the same line down to Gibbs’ house. What is now the Junior School was then a private house, with a fine garden extending over all the present playground and right up to the Bishop of Dover’s house; part of this garden was given to the Bishop of Dover when the Junior School was established in 1878 – that was, I believe, the date. I only mention this by the way, for others are far better qualified than I am to write about the Junior School, and it does not really come within the strict limits of my subject. Before leaving the south side of the Mint Yard, I must add that the doorway from the Yard to the present Grange is now as before, and is marked (B) in the plan, but then there was a high brick wall, marked (C) in the plan, which was in front of it and ran from the Auditor’s house to the tum into Palace Street, and in this wall was a doorway – also marked (H) – opposite to the door of the house. When this house – now called the Grange – was given over to the School, this wall was removed, but there did not then exist that unsightly excrescence between the Grange door and the Auditor’s house which is there now; that was built later to provide the Auditor’s house with an extra kitchen and servants’ rooms. We can now pass on to No. 12 – the old hall of the Boarders. It had two windows facing North, which therefore looked into the Mint Yard, and two more on the opposite side with a large fire-place between them. The windows were, I should think, about 5 or 6 feet from the floor, and from the floor to the windows the hall was panelled all round with old oak or chestnut. There was a long table down the centre, from East to West, for about two-thirds of the length of the hall, and in the centre of the table was a big wooden pillar carved all over with names, one very conspicuous in large letters at the top being C. Abbot – surely a forecast of the future eminence of the youthful carver! Another table stood at right angles to this, at the East end of the hall, and two other smaller ones, parallel to it, one under the North and one under the South window nearest to the Head Master’s house. The hall was often used as a Class Room and I remember Mr. Lipscombe and Mons. Martinet taking us in work there. I cannot recollect accurately any details of the Head Master’s house, though we sometimes went there in the evening to sing glees, generally when Dr. Rogers or Mr. Greatorex came from Durham on a visit; then Mr. Jones, the Cathedral Organist, was in evidence with his violin, and Mr. Rouch with his violoncello, but we boys were, I suppose, too much engaged in using our mouths for feasting and singing to pay much attention to aught else. Next we come to (15), a small bit of garden belonging to the Head Master’s house; all I can recollect about it is, that somehow we used to manage to look over into it, so as to see a lame sea-gull which had its home there. The Organist’s house (16) during the time of re-building on the East side, was used for the School, the lower part for class rooms, and the upper part for dormitories – later on it was in its turn duly doomed and disappeared. 17 m. was not likely to be forgotten – for in the wooden gates was a hole about the size of a duck’s egg; there during school, and therefore prohibited hours, it was not uncommon to hear a whistle or call, and in response the owner of the sweet-shop opposite appeared, and, for coins duly put through the said hole, returned by the same way corresponding sweet stuff! Could any lawfully gotten stuff ever taste so sweet as that? I give it up, and go on. When the Second Master’s house and garden – which latter, by the way, was much like that at the back of the present Grange – in their turn disappeared, the northern part of the space between the town wall on the West and the new School buildings on the East, was made into a broad Fives’ Court with a large buttress on the left and a doorway, which still exists, on the right, and splendid games we used to have there until the present Gymnasium was built and swallowed up the said Fives’ Court. The space between No. 19 and No. 20 was, I think, blank, and No. 20 also disappeared to make way for the new buildings, and we go on to notice Nos. 21, 22, and 23.·These were of old time, I believe, called the six-preachers’ houses or lodgings, but at the date of which I am writing, were in the use of the School, as I have noted in the plan. The two windows in (22) looked in to the Head Master’s garden, but were too high up for us to see through; those in (23) were large low windows and looked into the Mint Yard. The Head Master’s garden (24) was much larger than the present one, as a large slice was taken off to form part of the site for the present Head Master’s house, School hall, &c., and, further, the garden was much damaged for some time by being used as a stone-mason’s yard during the re-building. The Old Library (25), now so called, was then used as the School Library and was also always used as a class room. The present dark room underneath it was then a much darker room, with no window, no gas; it was used as a day-boys’ room in which they kept their surplices, books, &c.; but how they ever severally managed to find each his own belongings is a problem of the dark ages which no yet-discovered science could possibly solve! Lastly, we come to the big School room (28). In the old days the big fire place was used in winter and there was a giant coal box, about 3 feet cube, at its side. There was also a cupboard for pressed books in the S.W. corner. The old School room was, I must say, very bare, and has been much improved since those days, both in appearance and comfort, but details as to such improvement belong to more modern history. No. 29 has been sufficiently explained in the notes to the plan. This really ends the account of the old School buildings which were actually round and about the Mint Yard, but as I am upon this subject, I may as well stray a bit beyond the Mint Yard, and add a something about the Green Court as far as it is connected with the School belongings. The small house now known by us as Hodgson’s hall, was fifty years ago a private house: occupied by a Mr. Castleden, but it was given over to the School in Dr. Mitchinson’s time, and was used, first as the Mathematical Master’s house, afterwards, upon the death of Mr. Lipscombe, when the Second Master’s boarding house, now called the Grange, was combined with that of the Head Master and was re-arranged as at present, it was used for dormitories, &c.
The actual Green Court itself was in those days only a big plot of rank grass, intersected by brown stripes, for two broad pathways well worn by errand boys and casual pedestrians ran right across it, one from the house of the Master of the Choristers, now Mr. Plant’s house, to the School corner, and the other from Mr. Ryley’s house to that of the Bishop of Dover. No real cricket was possible on the green, only bowling practice from either end, along the worn paths, at wickets set up in the middle. A nondescript sort of football was played there, and the football matches of the School; and one can still see on the wall of the Auditor’s garden the painted marks of the L.G. (Lower Goal ). The Upper Goal had no such marks, which I can remember, but was formed of the piece of wall between the entrance gates to the Deanery front garden and the doorway to the Deanery back yard. And now I have finished the long task which you set me to do, but have only given you dry bones to digest, without any sauce, in the form of juicy stories, to help them down. Many of your old time readers may find many mistakes in my plan, and the description of it, and suggest many corrections! So much the better, if it leads to a more accurate account by some one else. I have done my best from my own school-boy recollections, supplemented by the help of Dr. Mitchinson, in whose reign the changes were made; a most eventful reign for the School buildings, and not only so, but for the School life, for I, who have lived through the reigns of four Head Masters, can certainly say, without any undue bias or flattery, that our School owes its present position, and its public tone and character, mainly to Dr. Mitchinson. I do not wish to detract anything from the merits of his successors in office – they have all done some good work in adding and improving various buildings, Gymnasium, Fives’ Courts, Parry Library, Laboratory, &c. Nay more, it was owing to the foresight of Dr. Blore, I believe, that the School obtained a money instead of a land grant for its maintenance; and again, the scheme of entrance and house scholarships was started, I believe, by Dr. Field; and, yet again, we see some of the value of Dr. Galpin’s regime in the larger numbers of the School, and its increased efficiency in many departments; but it is, I think and repeat, to Dr. Mitchinson’s reign and efforts that we owe, not only our main School buildings, but our public school tone and character, which his successors have carried on as his partners in the torch race. Leslie Goff Harrington Mason (1848-1927) was at the King’s School from 1861 to 1867. He went to Corpus Christi College, Cambridge and was ordained. He was an assistant master at King’s from 1871 to 1908 and was generally known as ‘Tar’. This article appeared in The Cantuarian of March 1911.